According to the Penguins, Matt Murray has a broken right hand. It's expected to see him miss the start of the NHL season. The injury, originally thought to be a sprained ligament in his hand, occurred during World Cup of Hockey play. The injury occurred on September 19th during his start for Team North America. 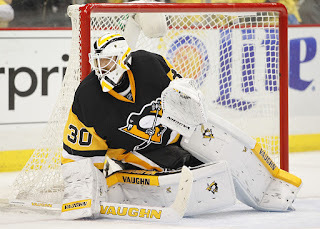 It was a game that saw Murray post poor numbers, 15 saves on 19 shots for a .789 save percentage. Murray's loss is now Marc-Andre Fleury's gain. Pittsburgh's de facto starter for years saw himself supplanted by Murray after a concussion knocked Fleury out for the playoffs. Matt Murray took over the reigns and led the Penguins to the Cup. An off season full of questions about possibly trading Fleury followed and Jim Rutherford held fast, insisting that holding on to both goaltenders was the best option. For the next 3-6 weeks, at least, Jim Rutherford was correct.